For this project, I worked with museum staff to re-conceive their web presence, analyzed business needs, wrote the project specification, selected and configured a system for displaying digital artifacts, worked with numerous technical service providers, and supervised external designers and programmers. A private social-media/educational website developed to enable geographically-dispersed homeschool students to engage with each other online during the week to plan, write, edit, and prepare their bi-weekly printed newspaper. The site was extremely versatile and successful for this educational social networking experience. In this site we used: file sharing, discussion forums, image uploading, task lists, direct email communication, resource sharing, and much more. The use of technology for this program enable the kids to do most of the planning, writing, chatting work from home, so the weekly class time could be used for in-house interviews, page layout and design, and other activities that required face-to-face time. A private interactive website to supplement an intensive geography-bee preparation class for middle-schoolers. Webpage designed for tercentennial conference at Yale University. 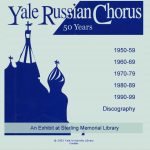 Created organization and navigation structure for this online exhibit about the history of the Yale Russian Chorus. Developed and managed Yale University’s library first web-based gateway for online research from 1996 – 2000.